Allo – a smart messaging app from Google. It’s an AI powered application, that let you express more without typing words. Its Smart Reply technology learns over your way of responding on messages you share and suggests responses to text and photos. The above COOL innovative feature currently lacks in WhatsApp. Will Allo be able to kill WhatsApp? It’s up to the Google how do they load Allo with features in upcoming updates. Right now Allo has the following features that WhatsApp lacks. Ink – doodle around your photo sharing by adding text or inking. 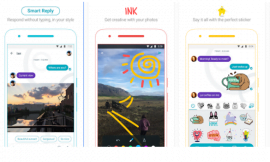 Stickers – here stickers in Allo are designed by independent artists and studios from around the world. SHOUT or whisper – a new way to text. In Allo you need not to type in ALL CAPS to get your point across. Say it louder or quieter by changing the size of your text with a quick swipe. Google Assistant – a new experience. Find restaurants nearby, share videos to watch, and get answers, right in your conversation with friends. Add @google to your group conversation or chat one-on-one with your Assistant. It’s your own personal Google, always ready to help.